I warn you in advance, you’re going to see a lot of recipes popping up that I’ve created to compliment grilled foods. Grilling is such a great option for the health-conscious eater. The grill gives a smoky flavor boost to foods and also allows a lot of the fat and calories to drip away from meats. I cooked up some steaks last weekend and I came up with this Roasted Beet Salad as a side dish. There’s a time and a place for pickled beets. They look fine sitting in a bowl at the end of the salad bar, but I was trying to up the ante here. I prefer the effect of roasting the beets. They turn soft and buttery and form a nice backdrop for a salad. A few fun facts about beets from the health professionals; they’re thought to ward off heart disease and certain forms of cancer, lessen inflammation and protect against birth defects. A few fun facts about beets from yours truly; numero uno: remember to wear gloves when you attempt to peel the beets after roasting. If you neglect this important pointer, your hands will look like a child who unsuccessfully colored a vat of pink Easter eggs. Numero two: try desperately to remember that you ate a whole bunch of beets for dinner. Don’t convince your husband that you’re internally bleeding after a post-dinner trip to the restroom. I speak from personal experience. Back to the recipe; the peppery arugula in this salad complements the sweetness of the beets perfectly. Folks who are watching their sugar intake shouldn’t be eating too many beets since they’re a high-sugar vegetable. Just watch your portion size. The creamy goat cheese and crunchy walnuts finish off the salad on a high note. No need for potato salad at this barbeque! This steak and salad combo was a really elegant looking plate and tasted so yummy that you really won’t miss a buffet of mayo salads. I’d also like to mention that my little bro writes a super informative beer and food blog. He’s really successful in pairing different (and often obscure) brews with home-cooked meals. I tried my hand at this idea and served this dinner with an interesting canned beer called Hell or High Watermelon from 21st Amendment Brewing Company. Yes, you heard me correctly, watermelon beer. For those of us girly types who like our wheat beer with tons of fruity undertones, this one hits the spot. It’s crisp and refreshing and although I paired it with this meal because I just happened to have it in the fridge, it really did work out well. 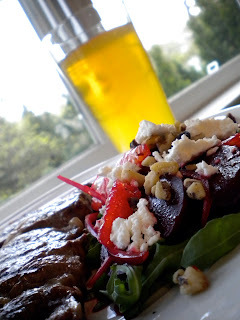 The fruit flavor in the beer went nicely with the sweet beets but at the same time cut through some of the fattiness of the steak. Definitely give this one a try. For those non-girly types looking for something a little more manly to pair with this delicious steak and salad combo, I can also reccomend Monks Blood (Also By 21st Amendment Brewing) its a smooth dark malty ale, but beware it'll sneak up on you with a hefty 8.3% alcohol. "Don’t convince your husband that you’re internally bleeding after a post-dinner trip to the restroom. I speak from personal experience." Well that's real nice. Lovely information. I really enjoyed your blog up until this moment. I am appalled and disgusted by this thought and imagery that is in my head right now. 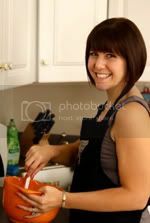 I think you should remember that this is a food blog and that people are coming here to read about cooking and eating. I personally am not interested in what color liquids were coming out of your lower half after you ingested beets. Although with a name like "diet it up" maybe you succeeded because I can surely say I have lost my appetite. Thanks for the feedback Suzanne. So sorry you feel that way. Just trying to bring a little humor to the plate. I'll watch my subject matter going forward. Thanks for the shout-out, Trish! I've never had watermelon beer, but I bet it's delicious with that salad. What would we do without the thought police in the world? I must need straightening out, because I was happy for the heads up so I could pull some hyjinks.